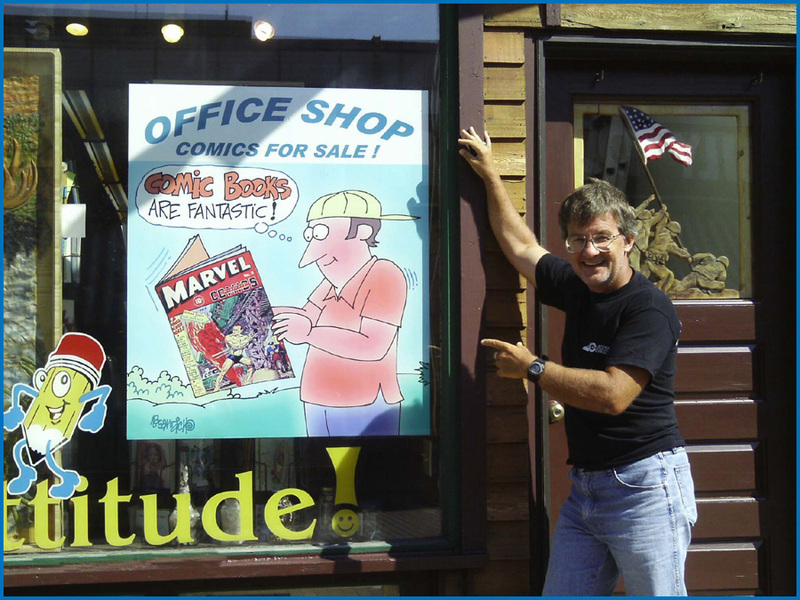 Custom cartoon posters can be created for your business. I have created custom cartoons for usage on many types of printed materials, Posters are yet another aspect to consider for your business. My work is currently available via my online stores at Zazzle and many of my cartoon posters are also available there. Use these for putting up in various other venues in your town or city to promote a service you provide or a specialty in which you cater to….. perhaps a delivery service, a disc jockey service or any other professional type of service you might provide. Schools, churches, in a student union building of a local university etc. The list is endless, but posters will attract attention to what you have to offer. 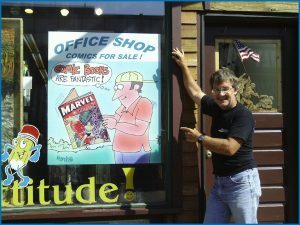 This photo was a poster I illustrated for an office supply shop whose owner had purchased a huge comic book collection. I sorted through the many tray of books which were well taken care of and stored in plastic sleeves….all flawless. There may have been some valuable gems within the overall number of books, which surpassed well over ten thousand comics. Many were from the 1990’s, some were DC Comics printed in 1990 and other unusual titles I wasn’t familiar with. I didn’t purchase the overall collection since I am not fully infatuated with the comic book scene. I should be, but I tend to go for underground comics instead of the sci-fi genre. But looking back, I should have purchased them. Since the owner eventually let them go for a couple thousand bucks. Of course, when it comes to collecting, the other thing to consider is storage space. But overall, the impetus to my post here goes back to poster design and cartoons. Keep images like comics and cartoon humor in mind for your next promotional project. Custom cartoons are very much the type of artwork that will work in conjunction with any print promotion! If you are considering a line of cartoon posters created for a specific project, contact me for information on a quote and we can collaborate on a project that will generate alot of attention for your company or business!